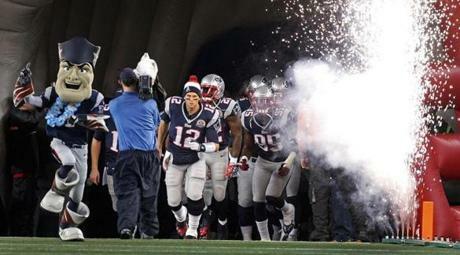 Patriots quarterback Tom Brady led his team out for the start of the game accompanied by fireworks. 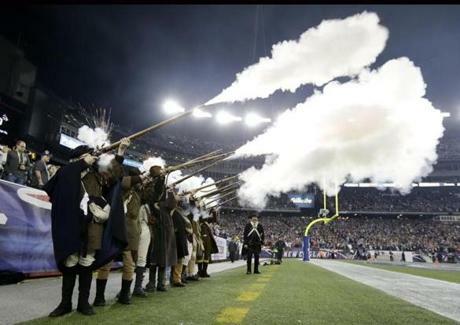 New England Patriots Minutemen actors fired rifles during the first quarter. Patriots running back Stevan Ridley picked up a first quarter first down as the Texans' Glover Quin tried to bring him down. Patriots wide receiver Wes Welker made a nice acrobatic catch of a pass from Tom Brady (not pictured) that was good for 25 yards and gave New England the ball at the Houston 4-yard line. 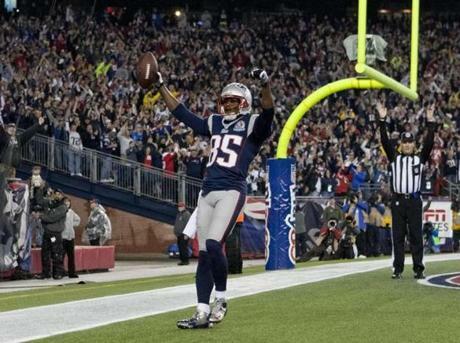 The Patriots' Brandon Lloyd celebrated his 37-yard touchdown reception against the Houston Texans during first quarter. Texans quarterback Mat Schaub (8) was sacked by Patriots DL Rob Ninkovich in the first quarter. New England's Vince Wilfork (bottom right) forced Houston Texans quarterback Matt Schaub to fumble during the first quarter. The Patriots' Aaron Hernandez recovered a Stevan Ridley fumble in front of the Texans' Kareem Jackson and Darryl Sharpton during first quarter action. Tight end Aaron Hernandez (81) of the New England Patriots and safety Glover Quin of the Houston Texans went up for the ball in the first half. 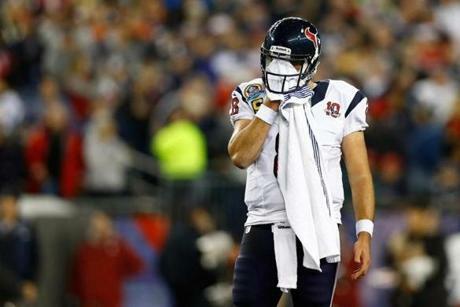 Quarterback Matt Schaub wiped his face in the first half. 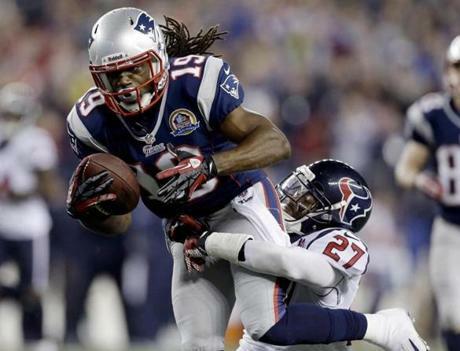 Wes Welker (right) broke away from Houston Texans safety Quintin Demps during the first half. 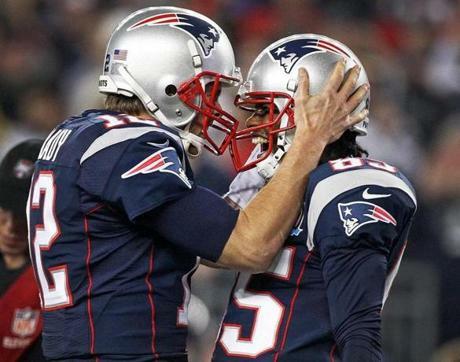 Brandon Lloyd was wide open as he hauled in a 37 yard touchdown pass from Tom Brady (left, pictured as they celebrated the score together) for the second New England score of the game. 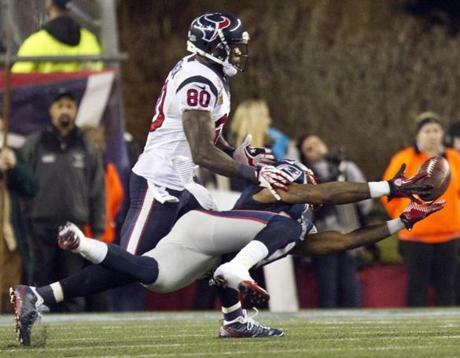 The Patriots' Kyle Arrington broke up a pass intended for the Texans' Lestar Jean during first quarter. Jerod Mayo stopped the Texans' Arian Foster for no gain as his teammate Rya Harris lost his helmet during the second half. 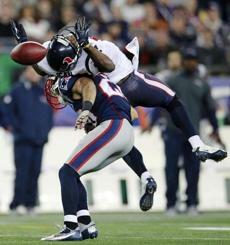 Patriots safety Steve Gregory broke up a pass intended for Texans wide receiver Lestar Jean, top, during the second quarter. The Patriots' third touchdown came whenTom Brady hit Aaron Hernandez with a quick pass, and Hernandez sidestepped Texans defender Danieal Manning and walked into the end zone for a tocuhdown. 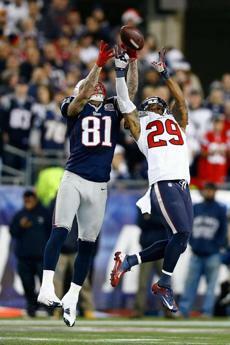 New England's Aquib Talib broke up a pass intended for Houston's Andre Johnson during second-quarter action. 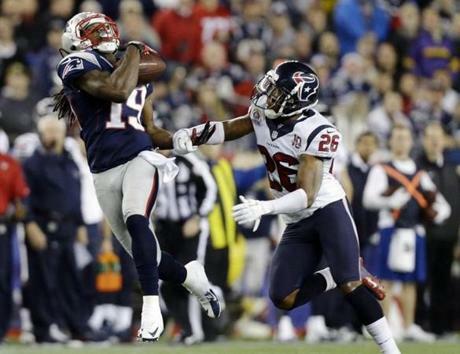 After Patriots wide receiver Donté Stallworth beat Texans defender Brandon Harris, left, he hauled in a pass from quarterback Tom Brady (not pictured), eluded out defenders, and dived into the end zone for a touchdown. 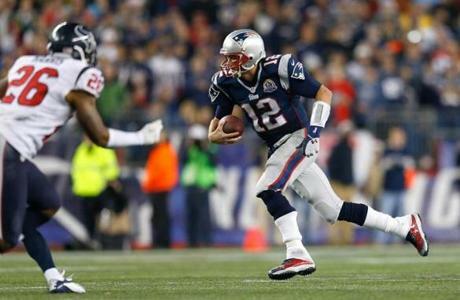 Tom Brady of the New England Patriots ran the ball for a first down against the Houston Texans in the second half. Texans fullback James Casey was flipped by the Patriots' Devin McCourty, but not before he picked up a 30-yard gain on a pass from quarterback Matt Schaub (not pictured) that gave Houston a first and goal at the New England 2-yard line and set up the Texans’ first touchdown of the game. Donté Stallworth dived into the end zone while dragging Houston Texans defensive back Quintin Demps, right, after a catch and run during the third quarter. Stallworth caught a pass in front of Houston Texans defensive back Brandon Harris before running it in for a touchdown during the third quarter. 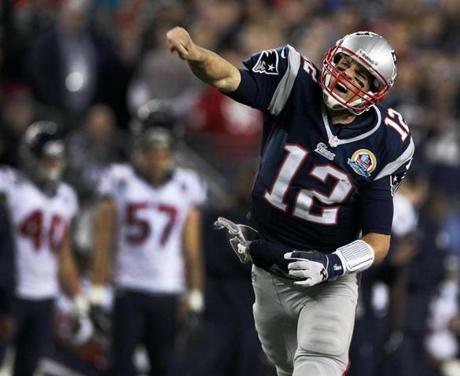 After scrambling to pick up a first down on the final play of the third quarter, an animated Tom Brady got up and howled as he demonstrably signaled first down himself. 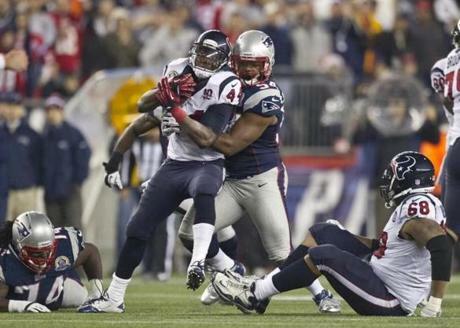 New England's Dont'a Hightower stopped Houston Texans running back Ben Tate during fourth quarter. 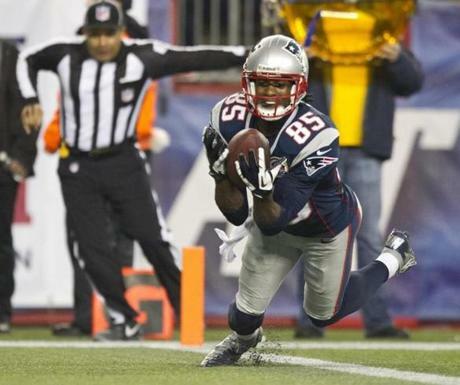 New England's Brandon Lloyd recovered teammate Danny Woodhead's fumble in the end zone for a touchdown against the Houston Texans during fourth quarter. After the Patriots' Stevan Ridely scored a fourth quarter touchdown, he and fellow running backs Brandon Bolden, Danny Woodhead, and Shane Vereen (right) did a celebratory jump together. 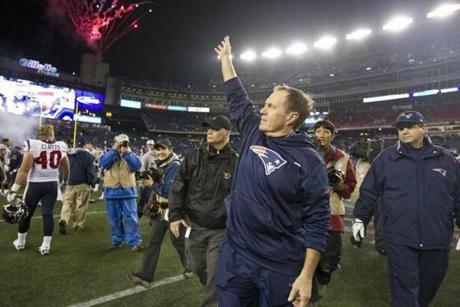 New England Patriots head coach Bill Belichick waved to fans after the 42-14 victory over the Houston Texans.